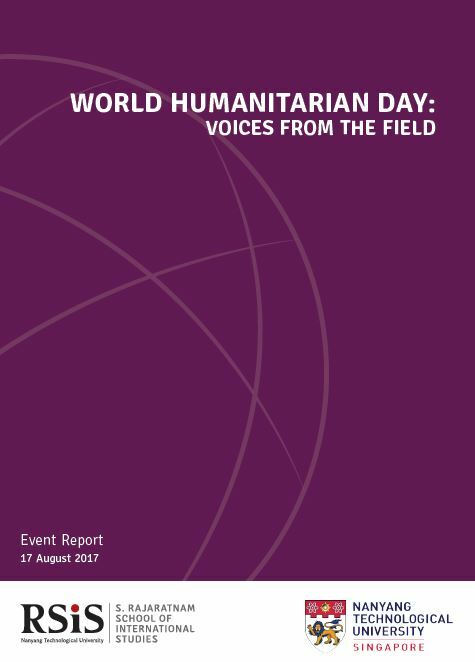 The Humanitarian Assistance and Disaster Relief (HADR) Programme at the S. Rajaratnam School of International Studies (RSIS), Nanyang Technological University (NTU), Singapore, commemorated World Humanitarian Day by organising a public event, ‘Voices from The Field’ at the Mandarin Oriental Singapore on the evening of 17th August 2017. This annual event included a panel discussion, poster exhibition, and a networking session. The three panellists were Mr Benjamin Jeyaraj William, Secretary General/CEO of the Singapore Red Cross, Dr Marlene Lee, member of the Board of Directors of Médecins Sans Frontières (MSF) Hong Kong, and Professor Lionel Lee, former Chief of the Singapore Armed Forces Medical Corps. World Humanitarian Day takes place every year on 19th August to recognise aid workers who risk their lives every day in adverse situations to help people most in need. It is important to recognise the challenges faced by humanitarian workers around the world and share their experiences so as to improve humanitarian responses in the future. The RSIS World Humanitarian Day event aims to raise public awareness of the humanitarian crises we face and the work undertaken by humanitarian actors to address them. By bringing together aid responders from different sectors, it provides a platform for the sharing of experiences from the field, and facilitates the exchange of ideas and insights. The RSIS World Humanitarian Day event provided an opportunity for members of the public to engage with the speakers during the panel discussion, and to find out more about humanitarian agencies through the various exhibitors including Badan Agama Dan Pelajaran Radin Mas (BAPA), the Earth Observatory of Singapore, Mercy Relief, Save the Children, World Vision, and the Humanitarian Assistance and Disaster Relief (HADR) Programme (RSIS). Overall, the World Humanitarian Day public panel and exhibition brought together a diverse range of humanitarian actors and the wider public to engage on the most pressing humanitarian challenges of our time.